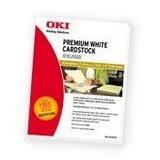 Oki 52208101 Premium Card Stoc..
Acid-free, archival quality. 8-1/2 x. Paper Color(s): White; Sheet Size: 8 1/2 x 11; Paper Weight: 110 lbs. ; Sheet Quantity: 100.